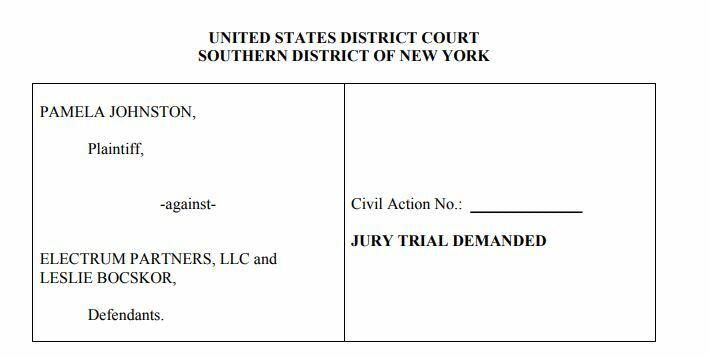 Pamela Johnston, who joined Electrum Partners, a cannabis business advisory firm based in Nevada, as Senior Vice President Strategy & Special Projects in early 2016, has filed suit against the firm and Leslie Bocskor, who serves as Managing Partner, alleging “violations of the New York City Human Rights Law stemming from her wrongful and discriminatory discharge undertaken because she told her employer she was suffering from cancer and because she engaged in protective activity in reporting certain sexual activities taking place at Electrum.” Johnston claims to have been terminated through an email in July from Electrum’s attorney, Zach Conine, after informing the company of her diagnosis of stage four cancer in June. According to the lawsuit, which was filed in New York, Johnston also reported examples of sexual misconduct by company employees to Electrum’s human resources director that went unaddressed, and she alleges that her termination may have been related to this additional factor. According to Johnston, the company claimed that her termination was the result of an audit of her expenses that took place in August and September, after her firing. Johnston is seeking lost wages as well as damages for pain and suffering.